The report covers the analysis and forecast of the hyperloop transportation system market on global as well as regional level. The study provides data for the forecast period between 2021 and 2030 based on revenue (US$ Mn). 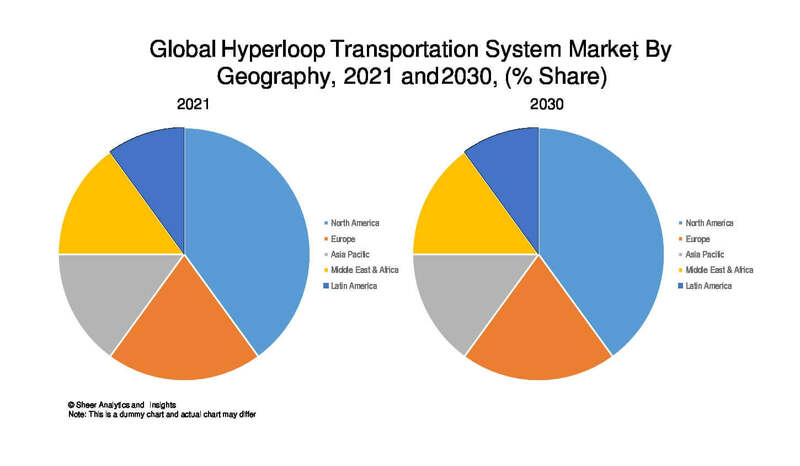 The study provides a detailed view of the hyperloop transportation system market, by segmenting it based on component type, by vehicle capsule and regional demand. In transportation sector, there are various services provided by rails, airplanes and others. The hyperloop technology is the modern mode of transportation in a fastest and cheapest way. The transportation types can be of two ways which includes passengers as well as cargo or freight transportation. Hyperloop transportation system market has been on a growing stage throughout the forecast period. In the coming years, the increasing demand of transportation system has a positive impact on hyperloop transportation system market thus augmenting the growth of this market. The hyperloop technology has the potential to transform the entire transport sector. Henceforth, hyperloop transportation system being the future of transportion network it is expected to flourish over the coming years. Regional segmentation includes the current and forecast demand for North America, Europe, Asia Pacific, Middle East & Africa, and Latin America. The segmentation is also done by component type and by vehicle capsule type. The competitive profiling of the key players in the global Hyperloop transportation system market across five broad geographic regions is included in the study. These include different business strategies adopted by the leading players and their recent developments, as in the field of transportation sector. A comprehensive analysis of the market dynamics that is inclusive of market drivers, restraints, and opportunities is part of the report. Additionally, the report includes potential opportunities in the Hyperloop Transportation system market at the global and regional levels. Market dynamics are the factors which impact the market growth, so their analysis helps understand the ongoing trends of the global market. Therefore, the report provides the forecast of the global market for the period from 2021 to 2030, along with offering an inclusive study of the Hyperloop transportation system market. The report provides the size of the Hyperloop transportation system market from 2021 and the forecast for the next nine years up to 2030. The size of the global hyperloop transportation system is provided in terms of revenue. Market revenue is defined in US$ Mn. The market dynamics prevalent in North America, Europe, Middle East and Africa, and Asia Pacific have been taken into account in estimating the growth of the global market. The Market estimates for this study have been based on revenue being derived through regional pricing trends. Demand for hyperloop transportation system has been derived by analyzing the global and regional demand for hyperloop technology in each application for its respective functions. The Hyperloop transportation system market has been analyzed based on expected demand. We have used the bottom-up approach to estimate the global revenue of the Hyperloop transportation system market, split into regions. Based on component type, by vehicle capsule type, we have summed up the individual revenues from all the regions to achieve the global revenue for Hyperloop transportation system. Various Companies were considered for the market share analysis, based on their innovation and application and revenue generation. In the absence of specific data related to the sales of hyperloop technology several privately held companies, calculated assumptions have been made in view of the company’s penetration and regional presence across all applications. The report covers a detailed competitive outlook that includes the market share and company profiles of key players operating in the global market. Key players profiled in the report include Hyperloop One, TransPod Inc., Hyperloop Transportation Technologies and SpaceX. Sample provided is a snapshot of a full fledge executive report and not to be used without permission of our company. Unauthorized usage will lead to legal proceedings towards the company or individual. In case of customization, please contact our sales team for requirements. Cargo or freights. Among the overall hyperloop transportation system market the passenger transportation holds the largest share. The hyperloop technology is expected to be the world’s fastest method of public transportation. The recent innovation in rail transportation system is an example of hyperloop transportation system. The hyperloop technology is the cheapest and fastest mode of transport in the years to come. Thus, hyperloop transportation being the future of transportation it is expected to enhance the market growth during the forecast period of 2022-2030. Hyperloop transportation system offers wide range of benefits in the public transport sector. These benefits may include smooth and faster way of travelling without wastage of time. The hyperloop train travels in a vacuum tube which states that there is almost no air and therefore the chances of air resistance are much less. Market of ‘Hyperloop Transportation System’ is still at a very nascent stage in some regions and with a billion dollar investments in research and development sector, market growth is expected to have a very high potential. The hyperloop transportation system market in report is segmented by component type which is further categorized into different parts such as steel, aluminium, solar array, rotor, stator, compressor, batteries and others. The report has been further segmented by vehicle capsule which includes capsule doors, interior and seats, propulsion systems, suspension and air bearings, braking system, and others. The global hyperloop transportation system market has been moreover segmented geographically into North America, Europe, Asia-Pacific, Middle East and Africa and Latin America. Hyperloop transportation system is one of a new kind of technology and is expected to grow at a high rate with the increase in transportation network across the globe. Hyperloop technology will be one of the major trends to gain traction in this market in the upcoming years. Also the cost of travel for hyperloop technology is assumed to be low as compared to trains and airplanes which in turn will certainly augment the the growth of hyperloop transportation system market.The rise in demand in the transportation network, hyperloop technology can increase the demand for hyperloop transportation system.